Hello friends, old and new! Today, I am sharing our 1960’s ranch style home tour. I’m so excited to be here at Debbiedoo’s. I’ve admired and followed her blog for years and am so honored to be sharing my home with her and you. Thanks so much for having my home on your tour, Debbie! First of all, let me introduce myself. My name is Angie and I blog at Postcards from the Ridge. I met my husband in college almost 25 years ago and we’ve been married for over 22 years. We’ve lived in our 1964 ranch style house for the past 7 years with our 2 teenage daughters, and there’s always some type of project (or three) in the works. I’m always painting something, and it helps that I work at the family paint and decorating shop 30 hours a week. The hardest part for me is always deciding on which color to use. I like so many different colors and styles! My style could be described best as eclectic, casual, collected, and comfortable. 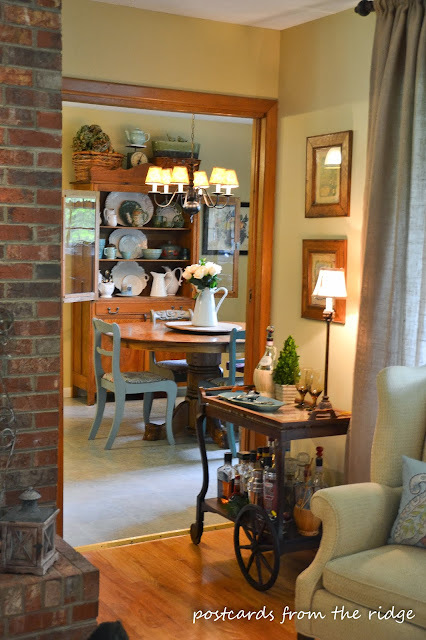 I like various decorating themes like farmhouse, vintage, mid-century modern, and some traditional. And I love to use items for something other than their intended use. If you’ve never visited my blog, you’ll find projects, tips and tutorials, favorite paint colors, room tours and decorating ideas. And we love to travel, so occasionally you’ll see a few photos from some of places we’ve visited. Enough about me. Let’s get on with the tour! Welcome! Come on in and stay a while! The entry is an ever-changing display of seasonal items. Currently it’s decorated for fall, but will get changed in a few weeks. This is my favorite area to decorate because it’s the first thing I see when I come home, and also because it’s the easiest and quickest to change. Anything that takes very little time and makes me happy has got to be a good thing. This is how it looked last year around Christmas. I used a photo tree I’ve had for years and put Christmas pictures of the girls from years past in it. If you want to see more pictures of how it looked at Christmas, go here. 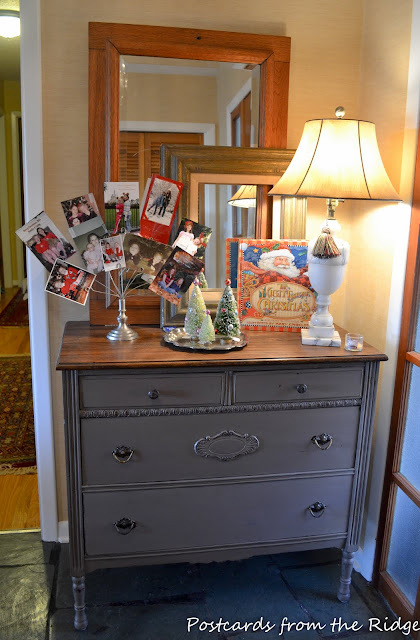 The dresser is one that I painted and distressed earlier this year. Inside the paint store where I work, I’ve claimed a small space where I sell some of my painted pieces and you can get a glimpse of it here, or you can see a few other pieces I’ve done here. The living room is the first room you see when you enter the house. I call this my space, since there’s no television or electronics in here. Just the windows, fireplace, and some comfy, casual furniture. The vintage doctor’s office window is one of my favorite finds ever. It’s from an old building about 10 miles from our house. It’s probably around 90 to 100 years old and I just love it. 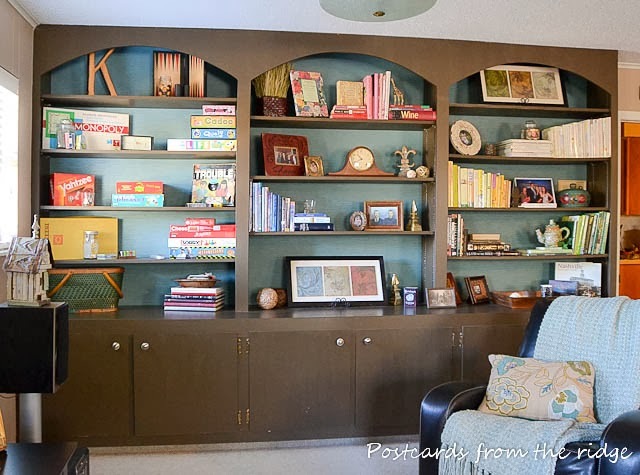 The sofa got a makeover last year with a simple dropcloth slipcover. And when I say simple, I mean simple. As in, no sewing and a wee bit slouchy but comfy. You can go here to get the how-to for that. Or go here to see a different furniture arrangement for this space as well as some of the other elements of the room. Another one of my favorite finds is the section of vintage iron gate that’s propped up behind the lanterns in the photo above. I bought it from a local antique shop a couple of years ago and had no idea what I would do with it at the time, but knew that I had to have it. It’s been in several places around the house and on the porch, but I really like it here…for now! Moral of the story: if you really love it, buy it if possible. You’ll find somewhere to use it. 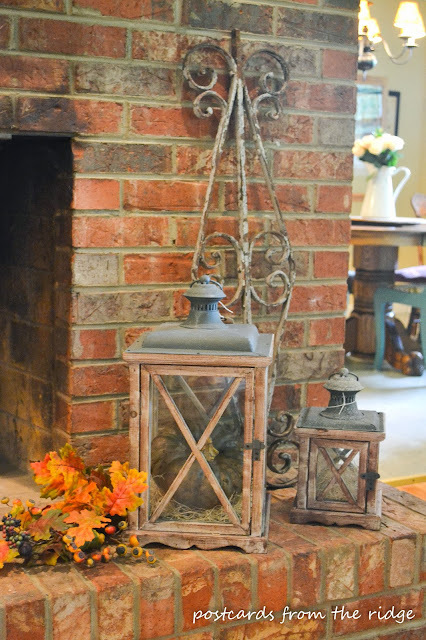 To see more of our fall decor, visit here. This fall I played around with several versions of decor on the mantel. The traditional version is shown above and here. 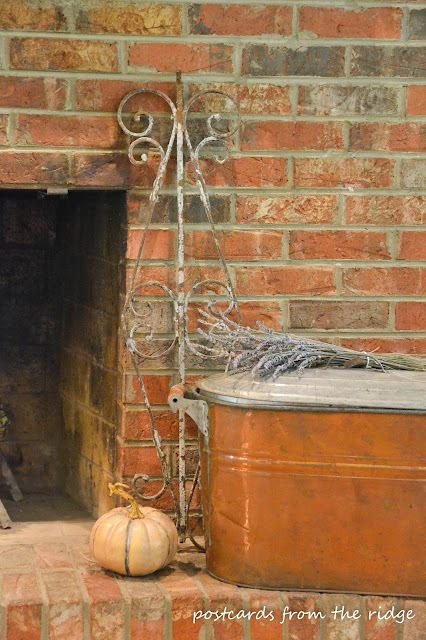 I also tried out some vintage farmhouse decor, shown here with an antique copper tub. If you’re interested in seeing more of this look, you can go here to see more photos. From the living room you can see directly into the breakfast room. “Playing house” here with some of my dishes. 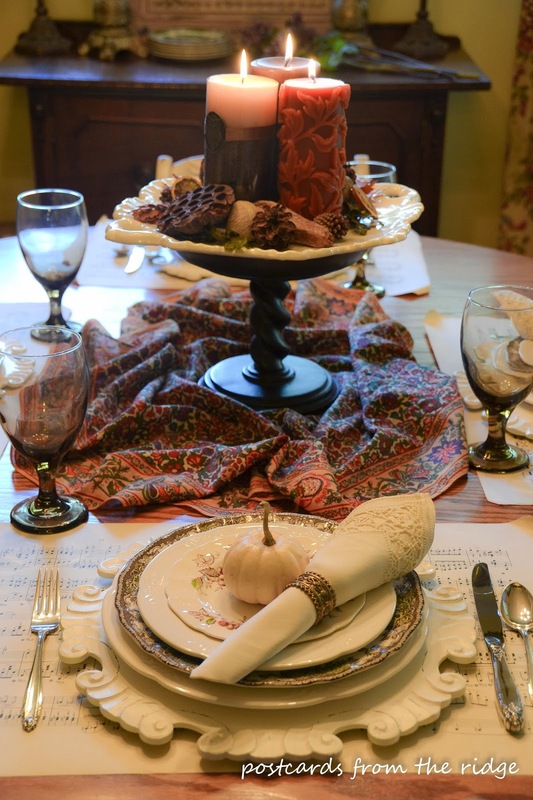 It’s always such fun to set a nice table. Dish hoarder? Me? Yeah, probably so. But I find them cheap and have so much fun with them. It’s better than therapy. It reminds me of how I used to play “house” when I was a little girl. Didn’t everyone do that? 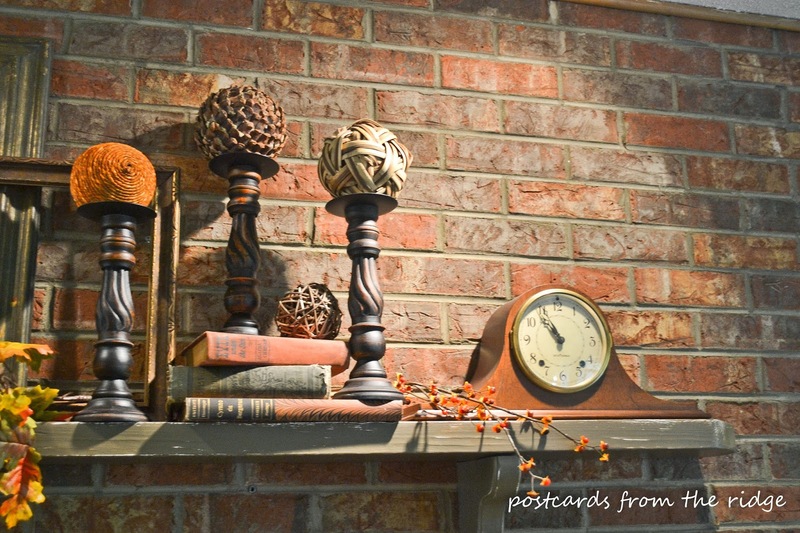 Here’s some more of our fall decor with natural items. One thing we like to do as a family is hiking or just being out in nature, so I really like to use natural, organic items whenever possible. To see more of our natural decor like this, you can go here. 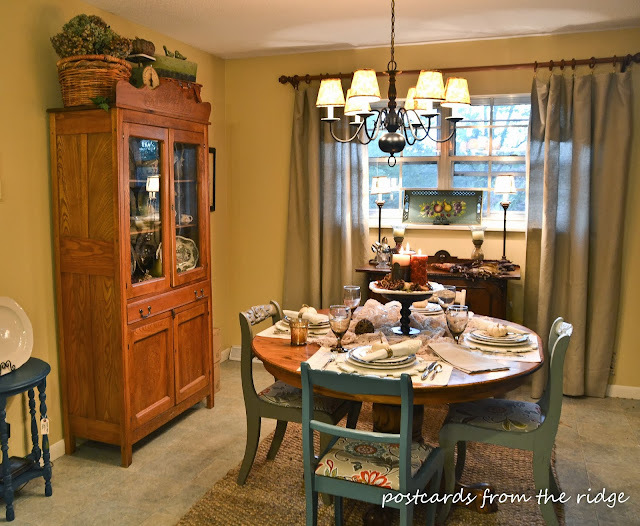 For more pictures of the breakfast room, go here. Our kitchen is truly the hub of activity in our house, as I’m sure it is in most homes. Admittedly, when we moved in, I wasn’t in love with these cabinets. Our last house had white cabinets (that I had painted) with nickel handles, and these hickory ones took some getting used to. They had shiny, round brass knobs which I switched out to oil-rubbed bronze, and that helped. I still don’t love them, but they’ve grown on me and I don’t dislike them enough to paint them. And honestly, they’re so much easier to keep clean than our white ones were. I’m all about low maintenance whenever possible, and they are definitely low maintenance. The island might get painted at some point in the near future, but probably not the cabinets. Some more vintage items here. I love putting the silver in the tarnished trophy. It’s such a fun way to display it. When we moved in, we had no money in the budget for tile on the backsplash, so what you see on the walls is actually hand painted faux tiles. Remember when I said I’m always painting something? I didn’t lie. For that project, I used pin-striping tape and several shades of paint in the little sample jars and a sea sponge to create the look of tumbled marble tiles for a fraction of the cost of the real thing. And as a bonus, when I get tired of that look, I won’t feel a bit guilty about changing it! 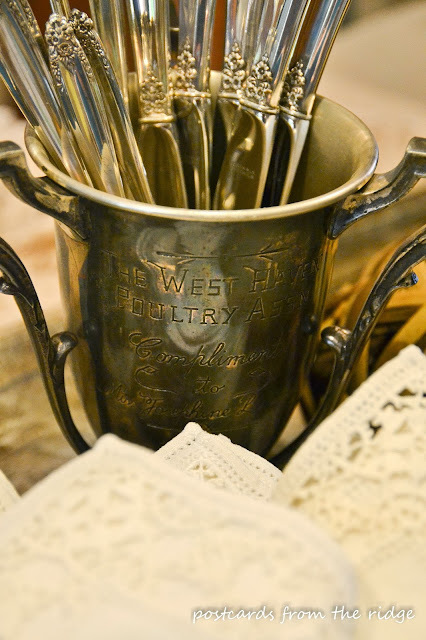 Some more vintage items and natural decor. The lace table throw came from a rummage sale for a couple of dollars. I just love finding treasures like that! 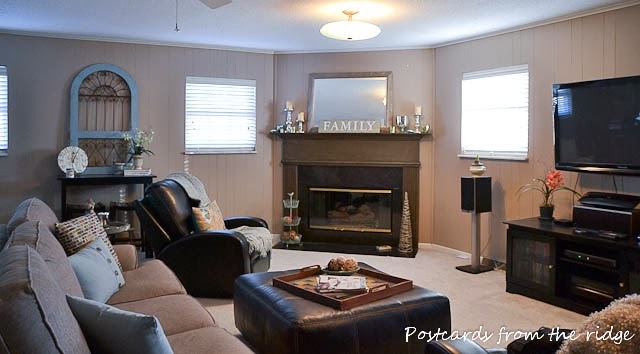 The family room is where we spend the most time in on nights and weekends. We watch college football on Saturdays (GO VOLS) and have Friday movie nights and even occasional game nights in this room. To see more of this room, go here. When we moved in, the room was covered in vintage 1964 paneling. As you can see, it’s still covered in paneling, but we gave it a facelift by painting it a couple of years ago. It looks 100 times better. 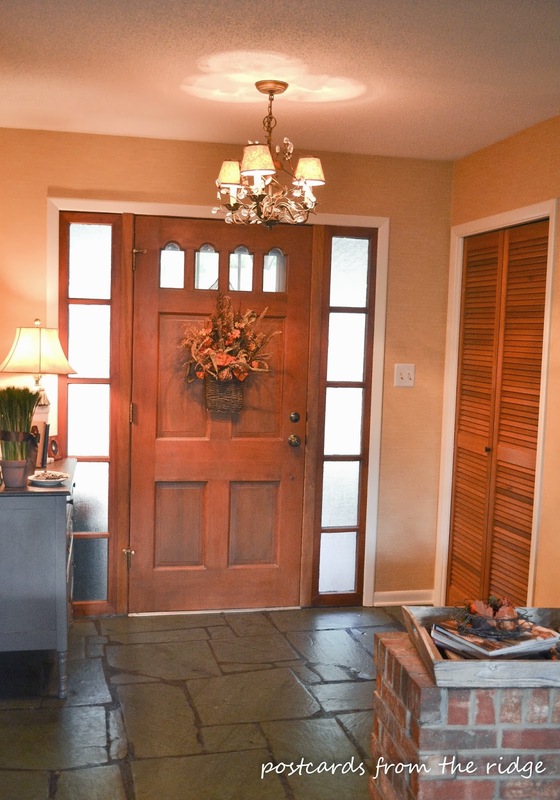 Painting paneling is such an easy and inexpensive way to update a dated space. If you want to see some photos of the room before we painted it, and learn how to paint paneling, you can go here. 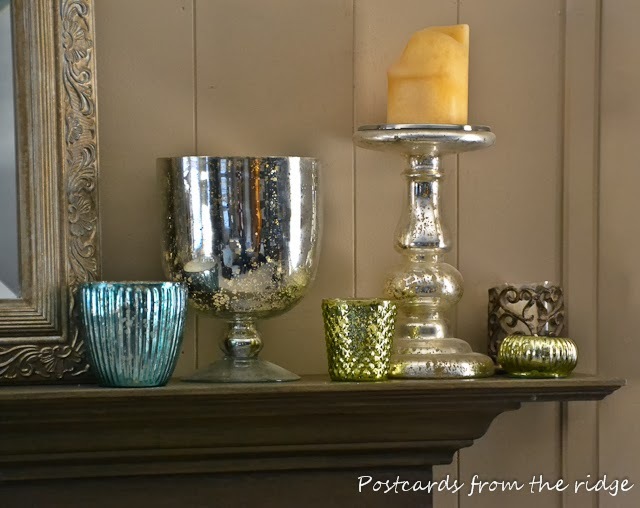 If you like to decorate in quirky ways like me, you might want to visit here to see how I decorated a mantel and hearth with some of the games. Like most of the house, this space gets changed up seasonally. Here’s some fall decor from the past. And some winter decor. I love mercury glass, and turquoise and green are two of my favorite colors. Can you tell? In the master bedroom, we have a casual, laid back style. 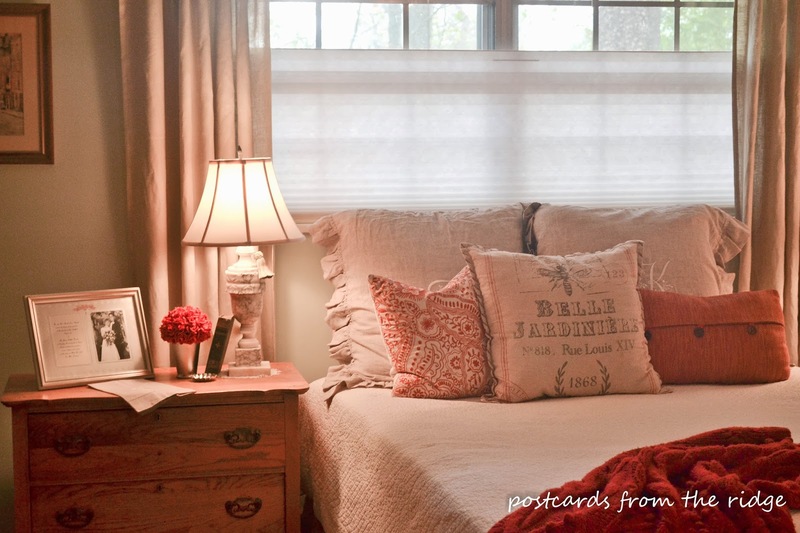 I like to keep the bedding neutral because I change out the pillows and accessories in the summer and winter. I still have some light summer colors in here now, but will be changing over to some heavier fabrics with some darker colors mixed in within the next few weeks. 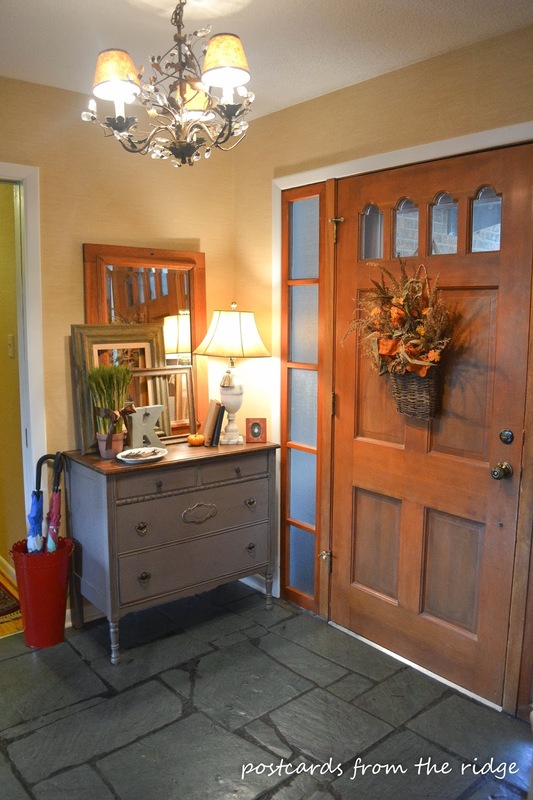 The alabaster lamps belonged to one of our former elderly neighbors. 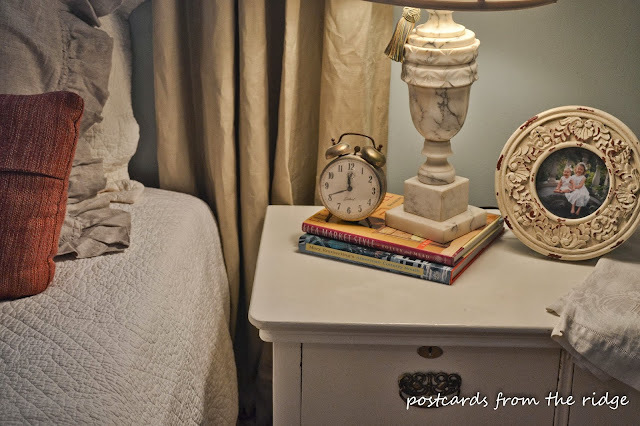 I have a thing for alabaster lamps. Then again, I have a “thing” for lots of old items. It’s a disease. Did you notice that we don’t have a headboard? Now you do, don’t you? That’s one of the things on my to-do list. I either want to make one from an old door or a fireplace mantel. Sounds a little crazy, huh? Someday I’ll get that marked off my list and actually have a headboard in here! An easy way to disguise the fact that we don’t have a headboard is by using the Euro shams. I snagged these on sale at Pottery Barn last year and really like the size of them. Last spring our master bath got a very much needed remodel. A leaky shower forced us to address the 1964 plumbing and fixtures. To see some of the before and after photos, you can go here. For the vanity, we used our old dining room buffet. I painted and glazed it and had our contractor retrofit the drawers so they would fit around the plumbing. We still have usable space in all three drawers. To see how it was done, go here. 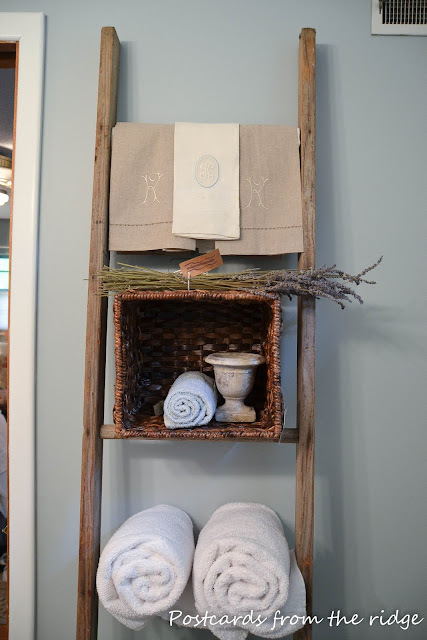 A vintage ladder gets used for towel storage in here. I love repurposing old things like that. And the texture of the old gray wood on the ladder somehow softens the feel of all the hard finishes in the bathroom. To see some other ways I’ve repurposed items, go here. Another thing I have a weakness for is homemade soaps and nice lotions. I also like old white dishes, and use the little curved dish above to hold my jewelry at the end of the day. On the back of the potty, I have a few pretty things displayed in an old wooden dough bowl. 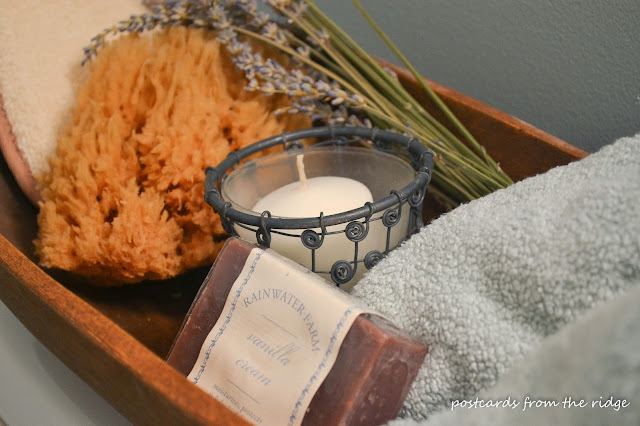 Vanilla cream soap, lavender, a sea sponge and a candle from Ballard makes the space much prettier, don’t you think? 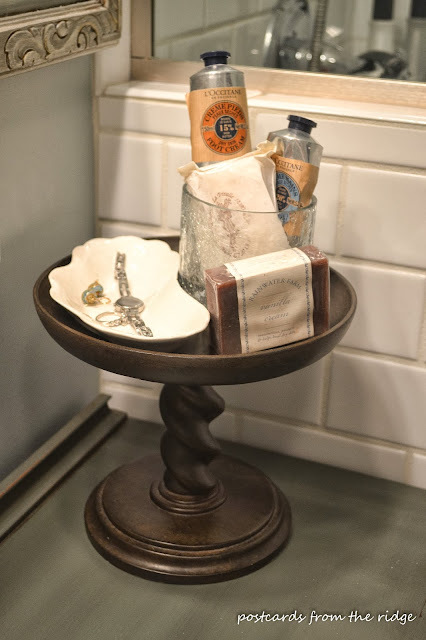 An old creamware platter is a great place for more pretty soaps. 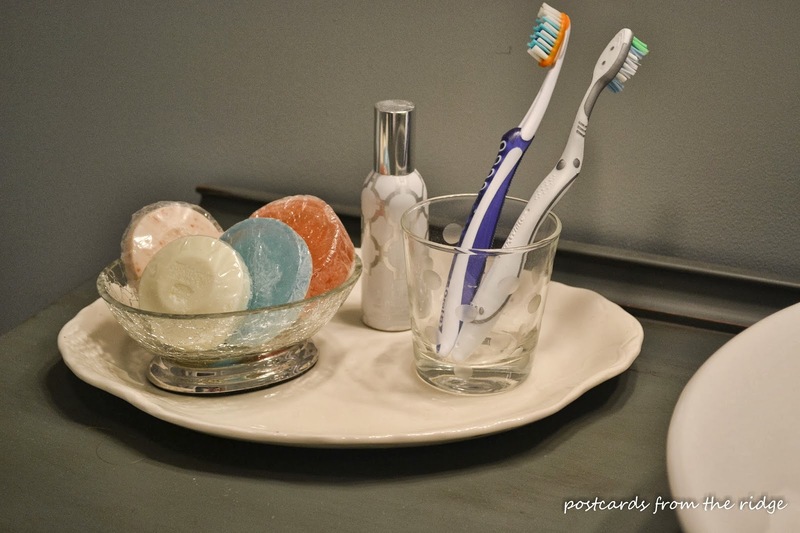 And I use a vintage polka dot cocktail glass for our toothbrushes. I think the platter and glass both came from yard sales. We’ll be remodeling our hall bath next month, so be sure to visit at the end of November to see how it turns out. I’ve got some great things planned for that space. 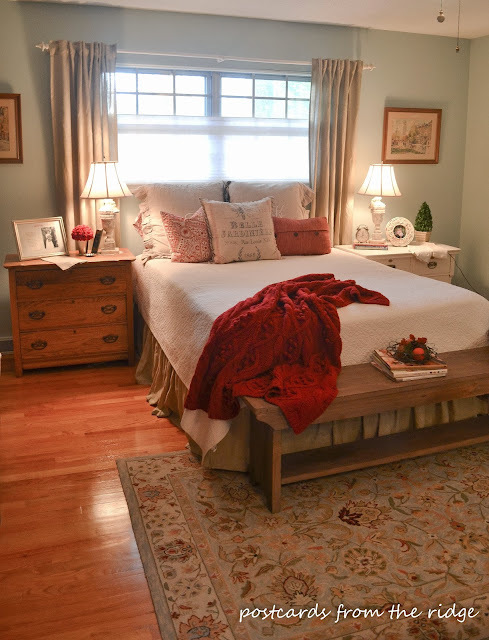 We gave the guest bedroom a makeover last year around the holidays and this is how it looked then. I’ve had the iron bed for probably 20+ years, and the night stands are the remnants of what used to be a dresser. The mirrors are some that I’ve accumulated over the last 15 or so years from flea markets, antique shops, etc. The antique desk was my late mother-in-laws and I’m so glad to have it. It was one of her favorite pieces, and is now one of my favorites. It’s always nice to have special pieces like this in the house. 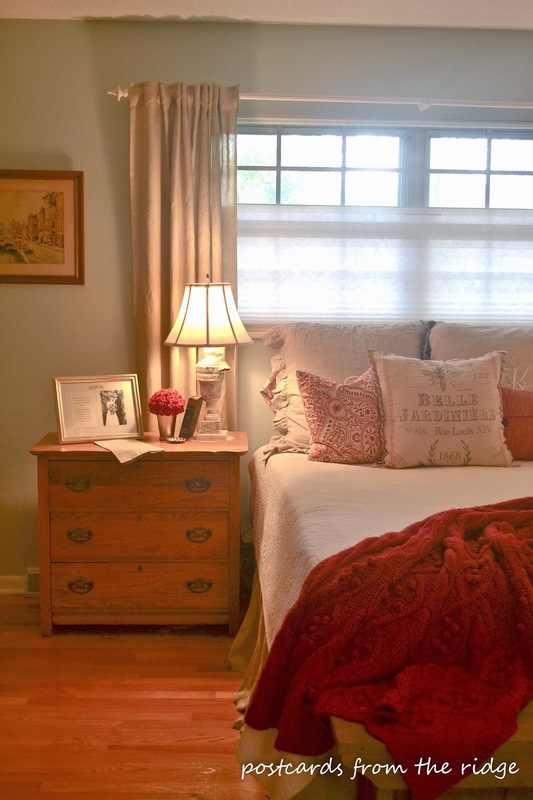 To see more of the guest bedroom, go here. 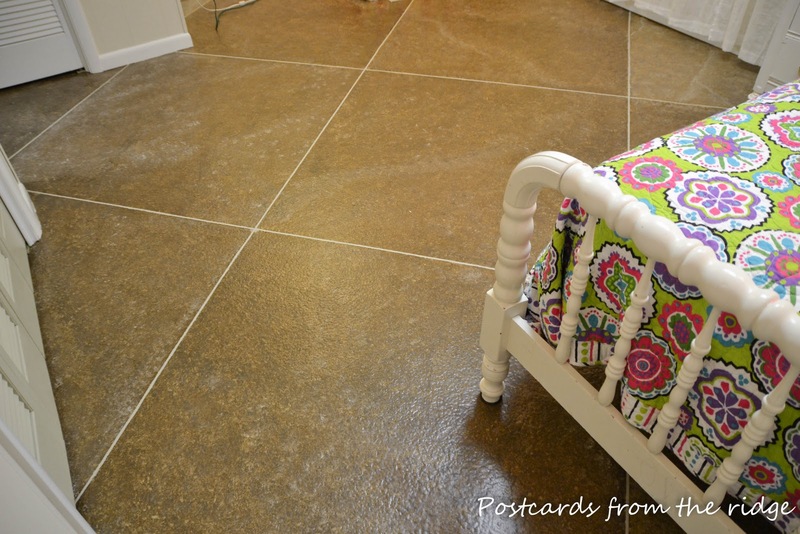 To see more pictures of this floor and to get the how-to for this project, you can go here. That’s about all for now, but we have several projects on our list, so stay tuned! Again, thanks so much Debbie for having me on your blog. 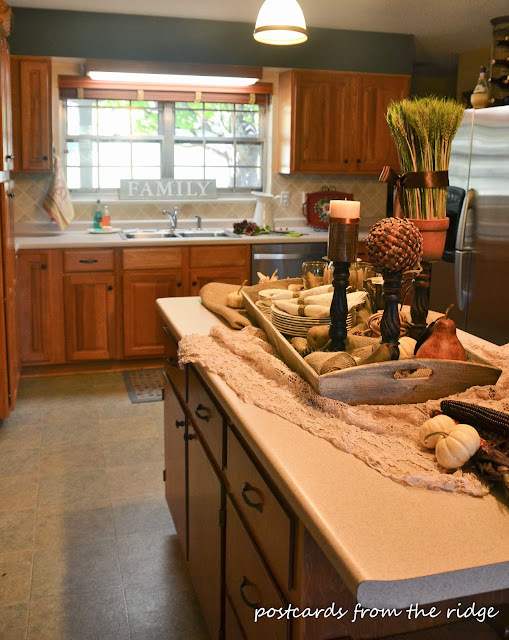 I’m so honored to have our house on your tour of homes. Your home looks so inviting and well decorated. It reminds me of my home growing up…sigh. Great choice – I love Angie’s house (and Angie!). I like your style. And, you are very talented with the variety of painting that you’ve done. Angie…I really love the warmth and coziness of your home. It really speaks “Family” to me! i have a lot of favorites in your rooms, your fireplace is wonderful and I love the lanterns on the hearth. 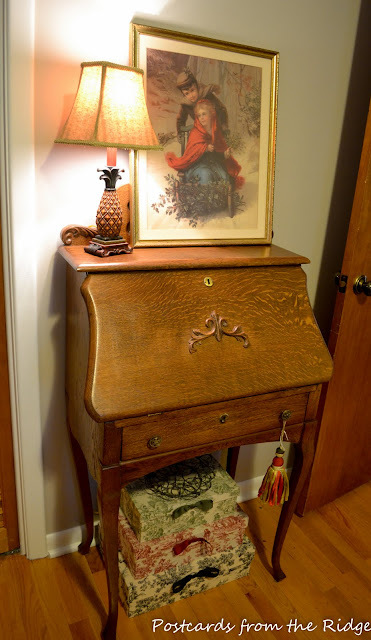 Your entryway is very pretty, I’d love an old dresser like that. You must have a lot of painting tips to share! And I do like your kitchen, the cabinets are perfect as they are. 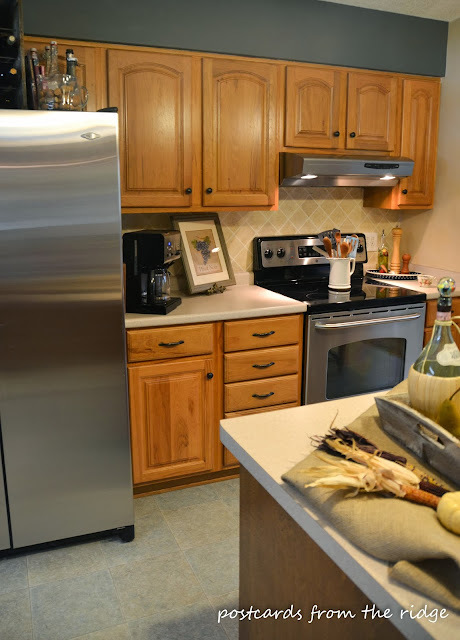 We have custom made pine cabinets and I would never let a drop of paint touch them!! 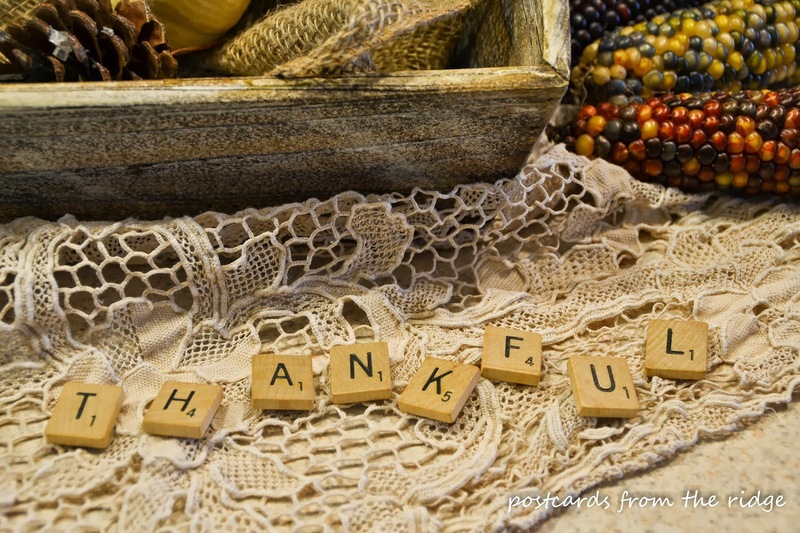 Debbie…thanks so much for having Angie to your blog! I absolutely love it! I could live there! Thanks to both of you for sharing! Off to check out Angie’s blog. Thanks for this great tour. So many pretties in her home. I follow Angie’s blog and she is very talented. Loved seeing her home and décor. Angie your house looks beautiful! 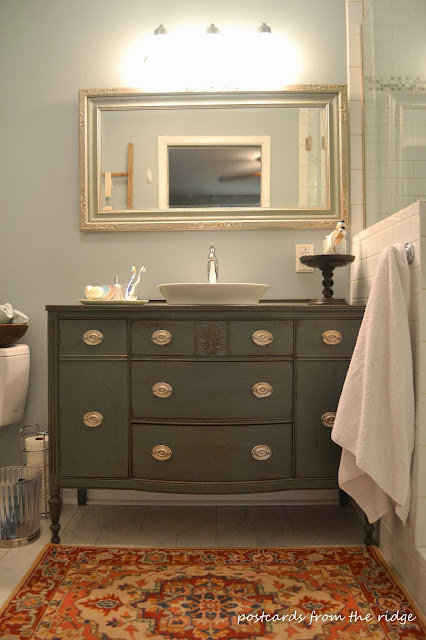 I am in love with your bathroom vanity and your bookshelves! PS I am hunting for a Dr’s window just like yours! I’ve gotta ask. Is that brick called “Bahama Blend”? It’s the exact same as what’s on our home. We built our house in 1979!!! Her home is beautiful! 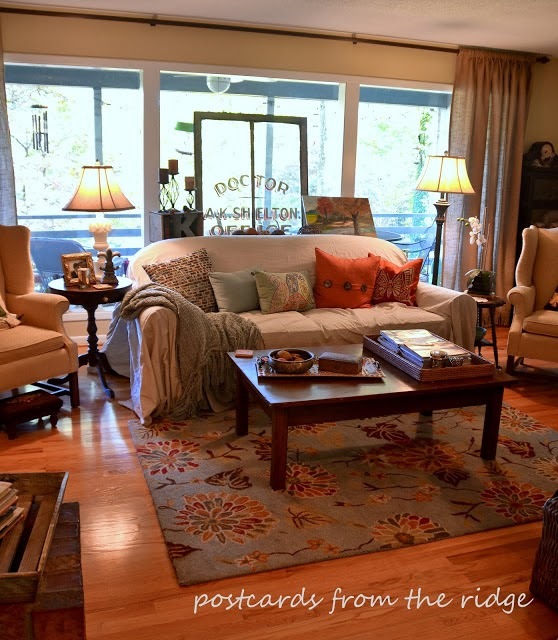 Hi Debbie, beautiful home…lots of details everywhere..thanks for sharing..will have to follow her blog now…(like I don’t have enough to keep up with aready) LOL…. Angie’s home is beautiful Debbie!! Love her style! What is the paint (make and color) of your living and dining room? Looks like a soft golden/tan tone and looks wonderful and warm with the stained trim wood.. Very pretty. I have had trouble finding a color that does not turn the old reddish colored pine trim on our two picture windows too red and look awful. What an awesome home tour! 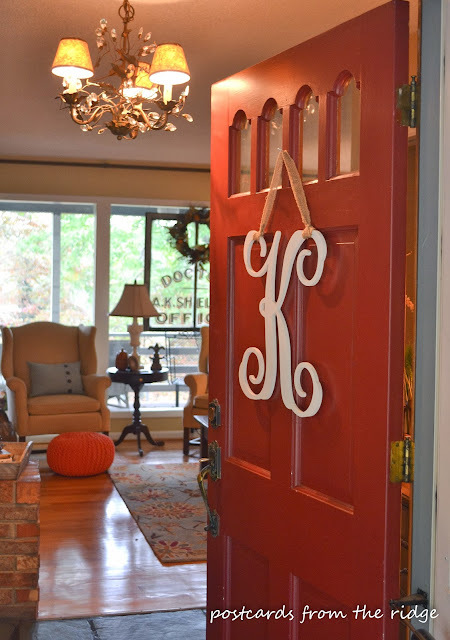 I love how she has decorated and styled her home…it all looks beautiful!! Thanks for these Friday Home Tours, Debbie. I always look forward to them! 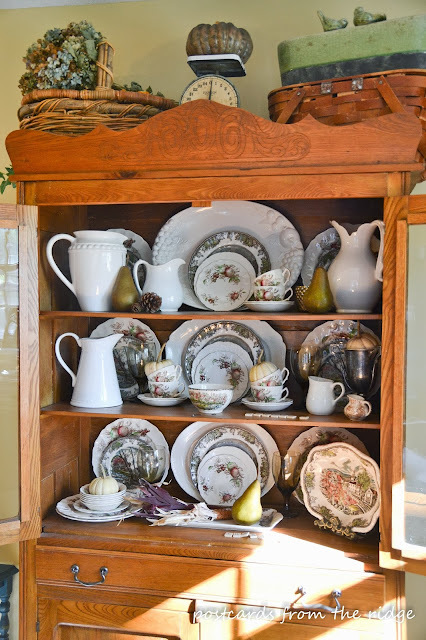 Angie, I have almost an identical china hutch as you do. I did a double take when I saw yours. Mine has a bit of carving in the middle of the top post and along the edges. And my drawers are actually two instead of one long one. We bought it at an antique store out here in So Cal probably 29 yrs ago and I love it. It’s one of my favorite pieces. Thanks again for posting the picture of the couch with the drop cloth. I knew I’d seen it somewhere but couldn’t remember where! Very nice. Love the old rancher styles that have been updated to meet today’s needs. One story living is best as we age. Great colors and style! I loved looking at these pics and seeing some things that we decorated similarly! I pinned a lot more ideas of what else I can do to update my ’60’s ranch! Thank you! Thank you so much I painted my 60’s paneling in my basement. We use this space all the time so my husband was not a fan when I first approached him with my idea. My husband went to Maine for a long weekend and when he came home our downstairs had been transformed. I followed your directions with the addition of filling in all of the groves, a lot of sanding, what a difference!!! The holidays were approaching so I finished with what I had started and now have a few more things to do which some involve precise measurements and ordering some new cabinetry, I am waiting on my father to return home for the summer to help. I will then take some pictures for you, but as I have Saturday coffee in my new space I wanted to thank you for your inspiration and direction. My suggestion to anyone with paneling PAINT!!!!! I love it! Thanks for sharing. 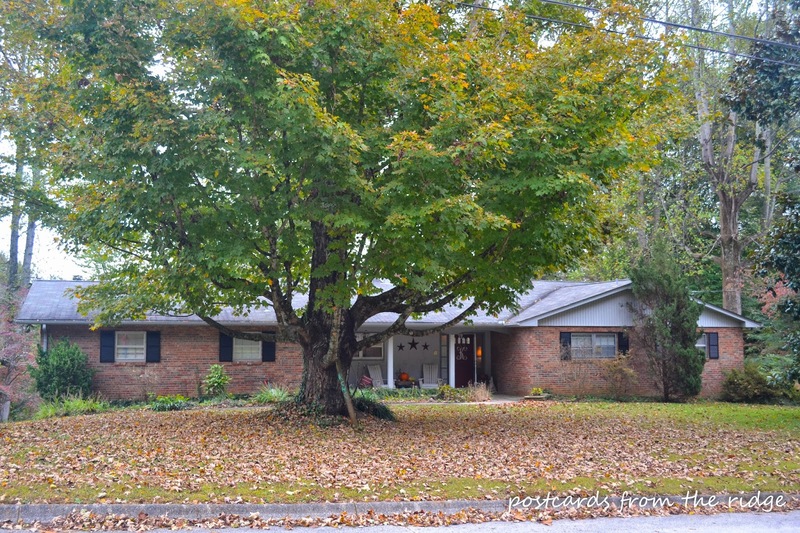 My husband and I are buying a 60s ranch, and you gave me some ideas. 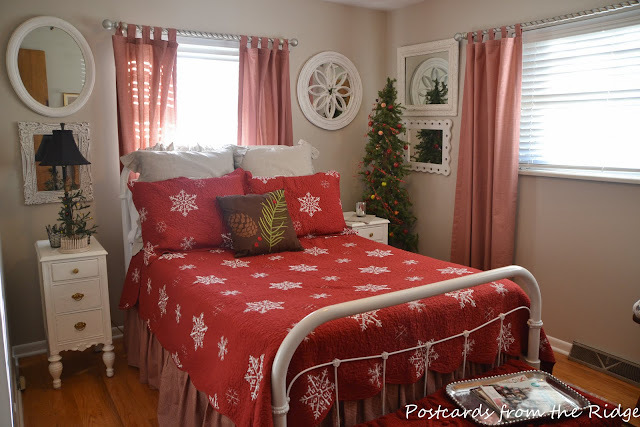 I especially love that festive guest bedroom.